The Snitch from London play raw funk that recreates the feel of obscure bands on small private labels in the early 1970s. Their first album ‘The Dirty Job’, recorded with primitive analogue equipment, became part of Warner/Chappell’s library music catalogue, available only for usage in TV and film. While you might have heard several tunes in programmes, trailers or films, the material has never been commercially released. 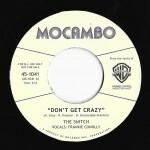 Two brilliant cuts are now availabe on 45 for the first time in a limited run of DJ promo copies. The Snitch’s funk is rough and dirty, fueled with heavy breaks and frantic horns like you’d only find them on a 300$ funk 45. Get your copy while they are still a bit cheaper. This entry was posted in 7" SINGLES by hank. Bookmark the permalink.